It is a Friday morning at Laveen Elementary, where students have a choice about how they can start their day. Recess. Or Yoga. When the doors open, children of all ages walk in, some with yoga mats in hand. Soon, their eyes close as they inhale and exhale, ready to be led in a quick yoga session by Gavin Tucker, an eighth-grade English Language Arts teacher. What is happening at Laveen may surprise some. Not only is there an early morning yoga class for all students, but also a midday one that has supplanted detention. In fact, the space that once housed students who misbehaved is now known as the Mind, Body and Spirit Room. Early results have been encouraging. The schools shows a 70% decrease in suspensions, office referrals, tardiness and absences, Tucker said. Like Tucker, many believe in yoga’s healing effects, especially for youth dealing with anxiety, the most common mental disorder of that age group, according to the Substance Abuse and Mental Health Services Administration. Too often, the organization reports, the anxiety is neither detected nor treated. This is the second full year that Tucker and his wife, Jackie, have led the school’s Mind, Body and Spirit Program, which was started with Tucker’s after-school program Live Pure Kids, which encouraged students to make healthier choices. Jackie Tucker had just finished her yoga certification at the South West Institute of Healing Arts and was asked by her husband to come to Laveen Elementary and do exercises with the students. 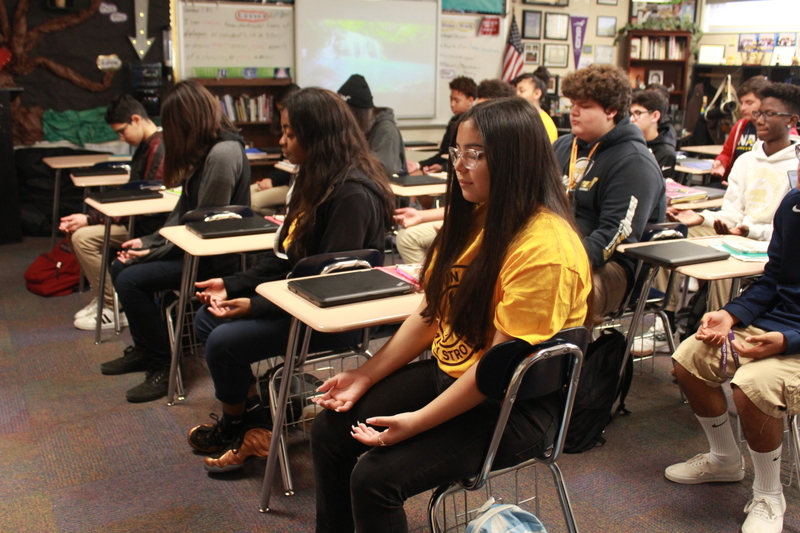 It caught the attention of the superintendent, and after doing research about the benefits of yoga for students, he asked the Tuckers to put together a whole curriculum. The idea of replacing the detention room with the MBS room came from Gavin Tucker’s personal experiences growing up. Other teachers at the school say they are on board. A 16-week study by the University of Arkansas that implemented yoga for students in kindergarten to third grade showed a significant decrease in anxiety and improvements in the ability to focus, according to Mackenzie Rosenberg’s article Reducing Anxiety in Elementary School Children by Implementing Yoga. “I’ve seen changes from panic attacks to no more panic attacks, “said Jackie Tucker, who spoke of students who previously lashed out in class but are now using breathing and calming techniques to self-regulate. “Now they’re learning that they don’t sometimes have to come in here because they are learning the tools they need to be out in the real world when things like that happen and there’s no MBS room. The Tuckers hope to expand their program not only districtwide, but nationwide, starting with a training session this summer for teachers who are interested in becoming certified in yoga and mindful breathing techniques.